The strawberries are ripening and the peonies are in full bloom. June is nearly out the door and I hope July brings a bit more sunshine and warmth. Clearly, this hybrid rose was not of the high end variety, but it's been a beauty none the less with a divine scent. The peonies are in the final glory for the season. 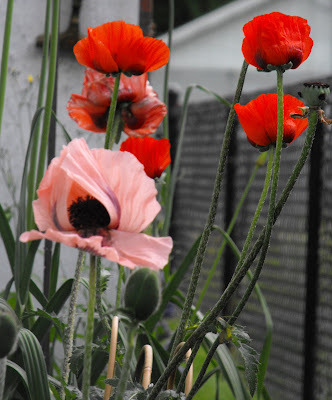 Poppies are cheering up the side yard near the bird feeders. 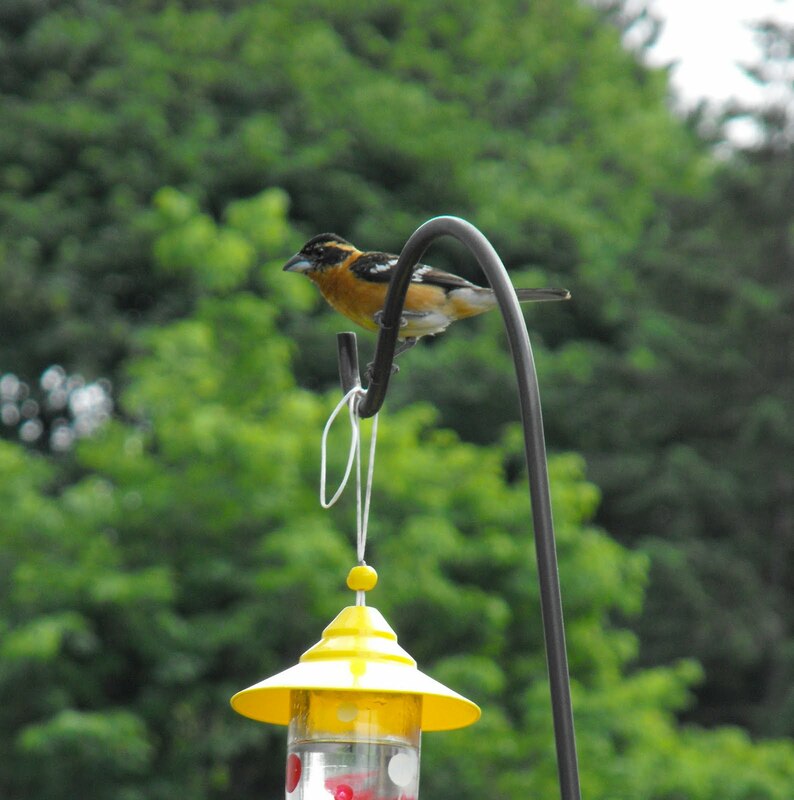 Here's a peek at some visitors to the feeders. My little boy's new mini rose 'Coffee Bean' is sporting some blooms. My son is quite excited about his rose. He regular tugs on my arms in the evenings to check out any new growth or blooms are his dear rose. What a turkey. Sunfire Coreopis adds some golden sunshine to the front flower beds. I am hoping it will provide blooms the majority of the summer. 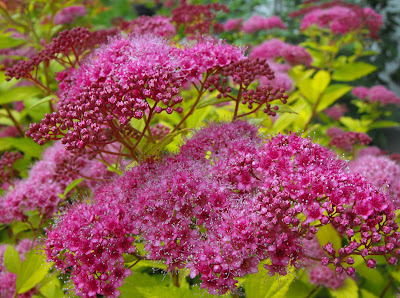 And finally the Spirea is presenting pillowy pink blossoms. The bee's are in heaven and I am delighted to see them out and about. The tag promised this was a 'dwarf'' variety. I have to chop it back yearly in early spring. I will say that it does fill in nicely but it is quite robust. Tonight, I had a surprise visitor at my hummingbird feeder, a male Anna Hummingbird. He puffed up and sat for an extended amount of time. Hm. I really need to wash the windows so I can snap a quick picture when these rare visitors arrive. 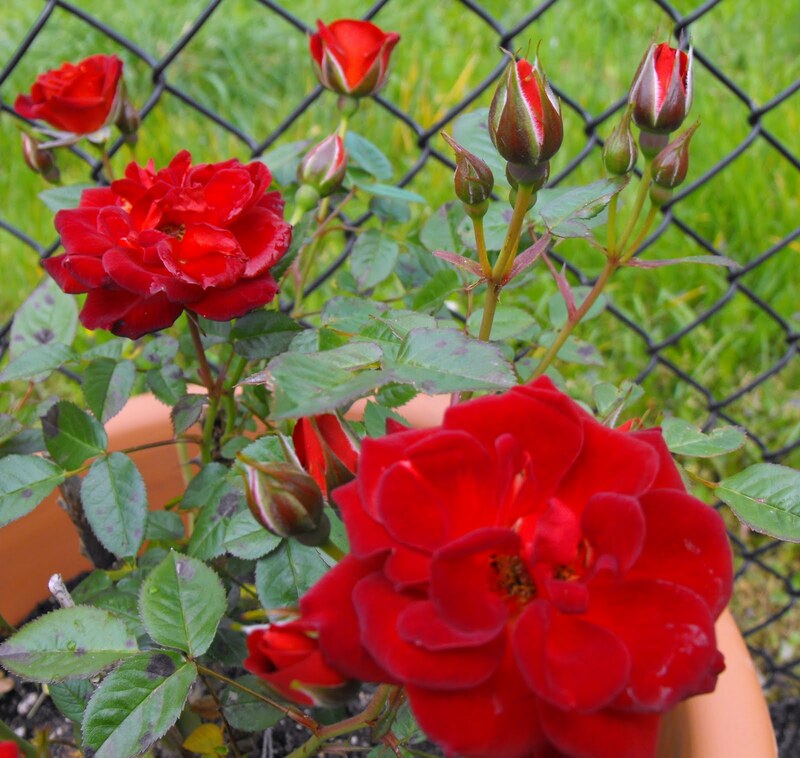 Swing by Tootsie's blog to see who else is showing off their blooms on this fine Friday! My peony is just budding up...and things are still struggling to bloom at all in Alberta!!! I am hoping that we get some real summertime weather here soon!!! thanks for linking in...your flowers are absolutely breathtaking...I am so glad you shared with us today! That Peace rose is a stunner! I included a pic of my Magic Carpet Spirea in my FF post too. I am looking forward to just a bit more heat next month. Beautiful blooms. I absolutely adore your Peace Rose and your Spirea is such a lovely colour. 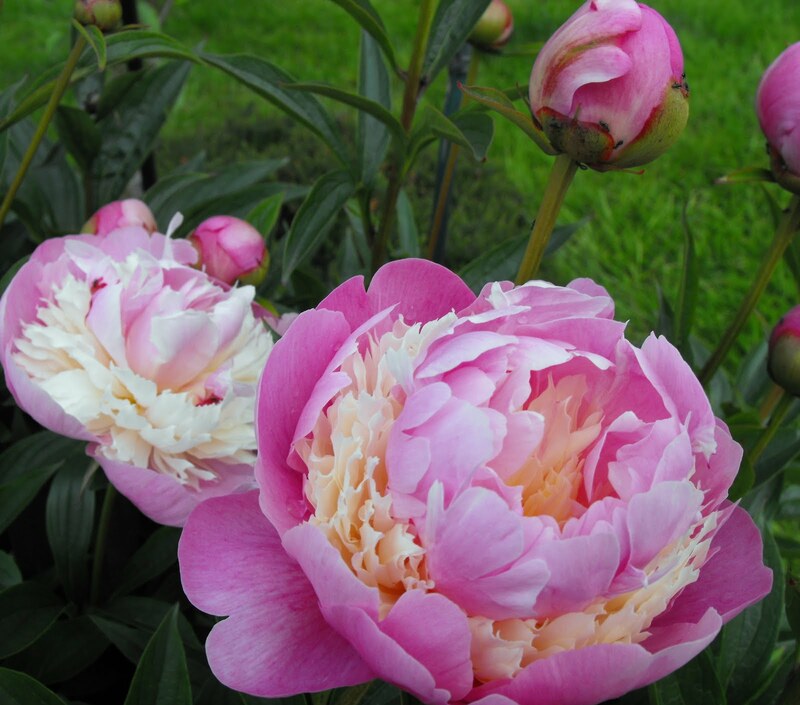 I have fell hard for the peonies this year via blogland, especially the sorbet. All of your blooms are so pretty. Congrats on the Anna! Jenni, that rose is just beautiful. I can grow them here in zone 4a, but we really have to baby them, and so I have stayed away from them. Your spirea is also particularily lovely. I have one that's similar in colour, called 'Neon Blaze' but your leaves look more yellowish-green than mine. 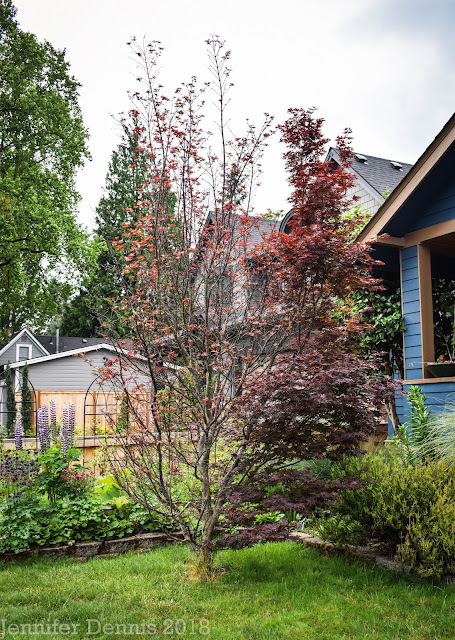 I have them planted right in my border and I also Really Cut them down to not let them get carried away. They always fill in nicely too. Your roses and peonies are just gorgeous! 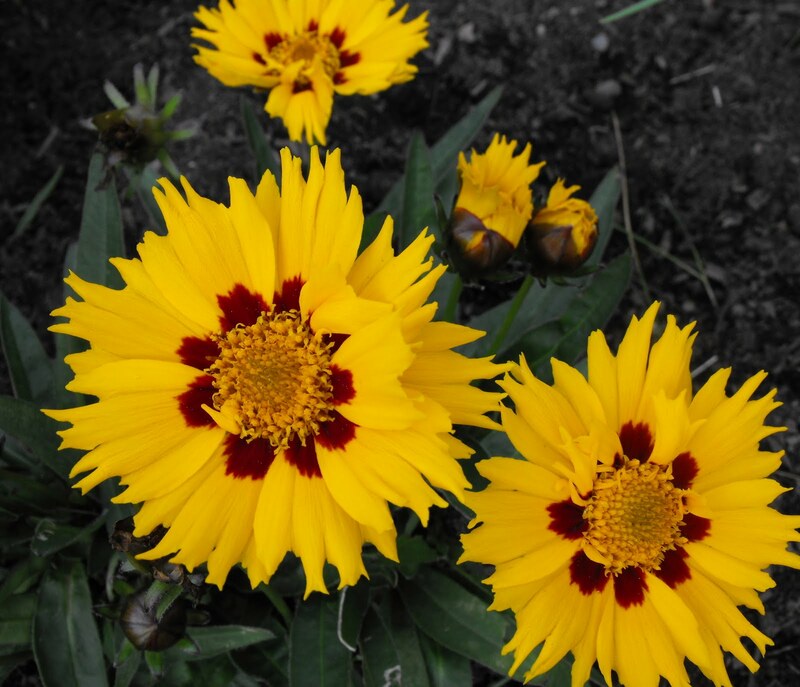 Love your coreopsis too. I have the same bird at my oriole feeder; I thought it was a female oriole. I am going to have to research this. Thanks for sharing your beauty today. Your peonies are so pretty as is the rest of your garden. How cute your son is so proud of his rose, he should be, it's gorgeous! Hi Jenni. 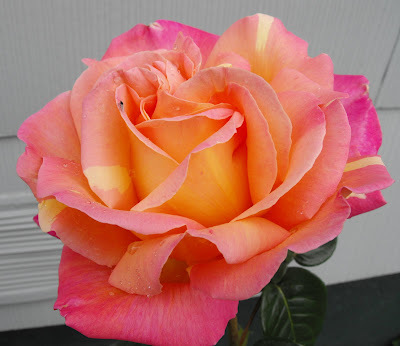 Now I love the looks of your Peace Rose and it is good to know it has a great fragrance. Your Sorbet peony looks so lovely. The delicate blooms on the Spirea is gorgeous too. 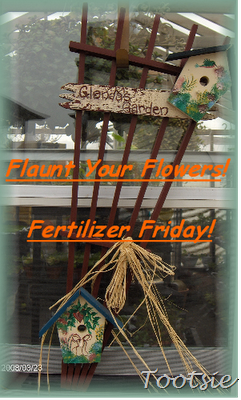 Wonderful blooms in your garden.Have a great weekend! Love your spirea, and I'm go excited your son's Coffee Bean rose is doing so well! What a beautiful color for a rose. 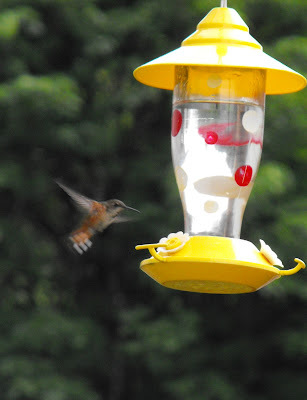 How great to have humming birds in the garden! Simply stunning! All your flowers are so beautiful. My sorbet peony doesn't look quite like that. Yours is very pretty! But washing windows is too close to housework. :) Great photos. Love the Chicago Peace, the Peony and bird visitors. I especially love 'Coffee Bean.' Your son is quite the little gardener! How about I grab a bottle of raspbery honey wine and come sit on your porch to enjoy the roses. I have rose envy. Mine have yet to bloom. Tell your son his rose is perfect. Jenni, lovely flowers and photos! Do you think we are finally going to get some warmth? Forecast today is for 73, tomorrow 80 here in the valley. Our veggies sure would love that. Hi Jenni - Your rose picture is gorgeous! 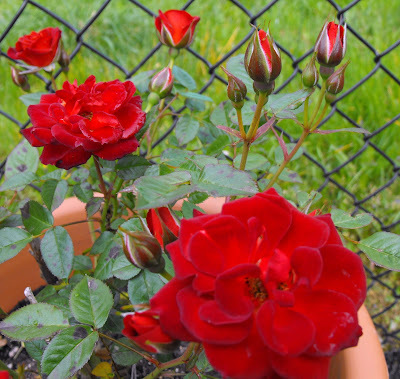 We have Knockout Roses in our yard, which I love because they're easy, but they don't have the fragrance of other roses. Hubby & I saw a Grosbeak just like in your picture today. Neither of us had ever seen one before and didn't know it was - until now! Beautiful! Is the Sorbet a double? Is it a rose-type peony?